Have a Small Business? We Can Help! If you have a small business, we have resources to help you succeed, including a digital video production studio, Smartblock workspace cubes and 24/7 expert research assistance. The One Button Studio is a digital video production studio that enables you to produce a video with the touch of a button. The Studio’s equipment includes an HD video camera, professional microphone, mounted lighting, and green screen. You can produce training videos, presentations, video resumes, and more. The One Button Studio is located at the Yardley-Makefield branch. Schedule an appointment to use the Studio here. 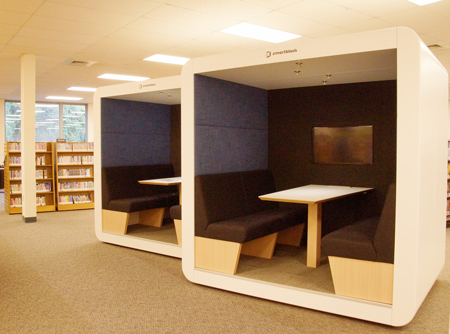 Smartblock workspace cubes are modular standalone workspaces. Each Smartblock contains a TV with HDMI/VGA connections, controlled lighting, and overhead speakers. You can use Smartblocks to conduct business, such as group or one-on-one client meetings. Two Smartblocks are located in our Yardley-Makefield branch and are available on a walk-in basis. All branches have free WiFi and offer places for you to meet and work in comfortable environments. Bring your coffee and your laptop or use one of the our computers. If you need privacy, you can use one of our quiet study rooms. Our staff can connect you to dedicated business resources. If you need research help after hours, contact Ask Here PA to chat with a librarian for help on any topic, 24/7.